Common Core Standards met in this lesson: RI.9-10.1, W.9-10.2 (see details below). •Define the concept of "Other" and identify examples of its application. •Define interconnectedness and find examples of it in Rousseau's life and work. •Identify and evaluate evidence that supports a point of view. •Apply what you have learned about "Otherness" and interconnectedness to your own life. The Context for "Rousseau's Turban": What is "Other"? 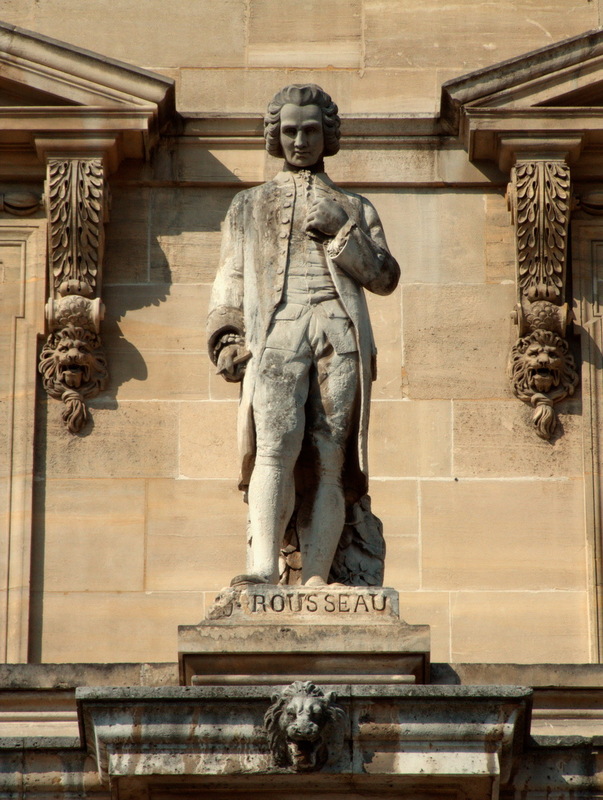 Jean-Jacques Rousseau lived during a time when many European thinkers defined the world as divided between West and East. According to this way of thinking, Western cultures were the norm, and Eastern cultures were somehow not "normal." People who held this belief system thought that the West was fundamentally different from—and better—the East. They believed that Eastern cultures were exotic, less civilized and, in general, not as good as Western. In recent decades, many scholars have argued that it was this sense of East as "Other"—as in "they're not like us"—that Europeans used to give moral justification to the largely commercial goals of colonialism. At Paris’s Louvre Museum, a statue now honors the writer whose thoughts were once so controversial he had to flee France. To clarify your understanding of the concept of "Other," write a definition of it in your own words. In your definition include an example of where you think a group has been defined as "Other." (Remember that "Otherness" doesn't say anything about what a group is really like: It just says what some other group—a group with more power—believes about it.) Your example can come from the past or the present. What makes you think the group you chose has been defined as "Other?" It might be how the group has been talked or written about, how the members of that group have been treated, or even, as in the example in the article, what has happened to entire countries or regions. Along with other volunteers, share your ideas with the class and together answer this question: What generalizations can you make about "Otherness" based on present-day or historical examples. Now that you've thought about the perspective that divides the world into "Us" and "Them," "Self" and "Other," think about how else the world, with its many peoples, might be viewed. Think about the examples you and your classmates talked about. How else might the people involved see each other? With your classmates, describe a point of view. Then turn your attention back to Rousseau. In "Rousseau's Turban," Coller argues that Rousseau, unlike many Europeans of his era, did not see Muslims as "Other." Find the place in the article where Coller states how Rousseau understood East and West. This statement is central to "Rousseau's Turban." Write it on chart paper so that it can guide your reading and understanding of the article. What Evidence Reveals Rousseau's Views of the West and East? Like any good writer, Coller doesn't just make a statement and assert that it's true. He provides evidence to support the claim, showing you, his readers, that his statements are accurate. As a critical reader, you need to see if his evidence convinces you that his ideas are true. So let's take a closer look. Go through the article and highlight or underline the parts that show "Rousseau was closer to the Muslim world" than many other European writers of his era. Consider both events in his life and examples from his writings. What similarities died Rousseau see between Christian and Muslim? West and East? Compare your notations with another student's. Remember that these examples are meant to persuade you that Rousseau didn't see Muslims as "Other." Do you find the evidence persuasive? If so, what is it that convinces you? If not, what would you need to see to be convinced? Some of the examples you've highlighted show ways in which the 18th-century world and its people were connected to each other. Maybe they're more connected than you realized initially. After all, they didn't have mobile phones, Facebook or Instagram. But even without high-tech connections, the 18th-century world was very much interconnected. You might say that Rousseau saw people of different places and religions as more connected than separate. Of the evidence you identified that supported Coller's thesis, which points support the statement that Rousseau understood the world as interconnected? Now think about what you can infer from the article about "Otherness" and "Interconnectedness." Return to your definition of "Other." Look at your example of a group being defined as "Other." How connected is/was that group that was defining it? Based on Rousseau's writing, and on Coller's analysis, how would you describe the relationship between "Otherness" and "Interconnectedness?" What Can You Do to Expand Your Circle of Connectedness? One way that people fall into seeing the world in terms of "Us" and "Them" ("Self" and "Other") is by focusing on people they don't know and on differences among people. To expand your sense of connection to others, identify someone in your class, school or neighborhood that you don't know. Introduce yourself to that person. See if you can find something to talk about that you have in common. RI.9-10.1 Cite strong and thorough textual evidence to support analysis of what the text explicitly and implicitly says. W.9-10.2 Determine a central idea of a text and analyze its development over the course of the text, including how it emerges and is shaped and refined by specific details; provide an objective summary of the text.